(Inside Science) -- On a bright day in 1981, John Eichelberger stood on a blackened crust above billions of gallons of lava. Plumes of steam leaked from cracks in the basalt surface, driven upward by the lingering smolder of Hawaii's 1959 Kilauea eruption. That eruption had filled a crater hundreds of feet deep with liquid rock. After two decades of cooling, the lava lake had hardened to a depth of about 100 feet, and Eichelberger was studying what lay at its still-molten heart. The drilling team carefully guided their rumbling machinery, lifting long steel pipes from a hole the width of Eichelberger's fist. The pipes contained hot cylinders of rock laced with glass that had been liquid moments before. As each new section emerged, the water the drill rig had pumped down the hole escaped in a cloud, leaving the tunnel clear. "You could look down the hole and see the glowing red eye of Vulcan looking back at you," said Eichelberger. For the young volcanologist, the Kilauea Iki lava lake was a rare opportunity to get close to the hot, oozing processes that underlie eruptions. But the congealing lava lake could offer only a rough approximation of what really goes on within the Earth's crust. That's because lava is fundamentally changed by its escape to the surface. 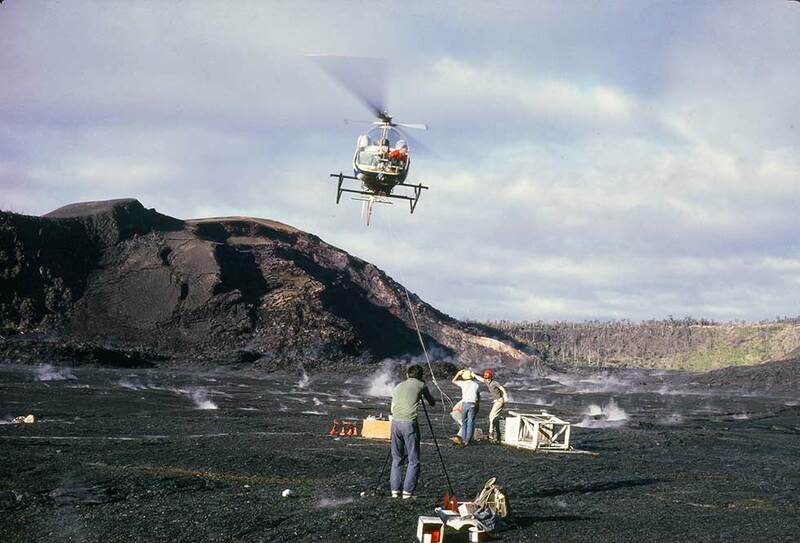 A helicopter lowers equipment onto Kilauea Iki lava lake in preparation for scientific drilling in 1967. True magma is enclosed in subterranean chambers, and these chambers are thought to have complex internal structures that vary in temperature, consistency and composition. When magma erupts, that structure is lost, along with water and other volatile chemicals that boil off into the air. Researchers could smell those escaping chemicals at Kilauea Iki in prior years -- a sulfurous stench coming from cracks and drill holes, said Rosalind Helz, a retired geologist with the U.S. Geological Survey in Reston, Virginia, who participated in several drilling efforts there. By the time Eichelberger arrived in 1981, steam was still escaping, but the sulfur smells were gone. Eichelberger's experience at Kilauea Iki ignited a hunger to find the real thing. Placing instruments in a magma chamber and extracting samples of its quenched contents could allow researchers to finally unravel the mysteries of how magma melts, crystallizes and flows. Eichelberger believes such discoveries could lead to better eruption predictions, and perhaps someday enable people to tap magma's vast stores of heat as a source of clean energy. Now, 37 years later, Eichelberger's dreams may finally be coming true. He and his collaborators are gathering funds and partnerships to set up a permanent research station called the Krafla Magma Testbed, at a site in Iceland where Eichelberger knows for certain that magma lies within reach. He knows it's there because someone already hit it -- by accident. John Eichelberger teaches students about magma in Alaska's Valley of Ten Thousand Smokes in 2011. Rights Information: This photo can be reproduced only with this Inside Science article. 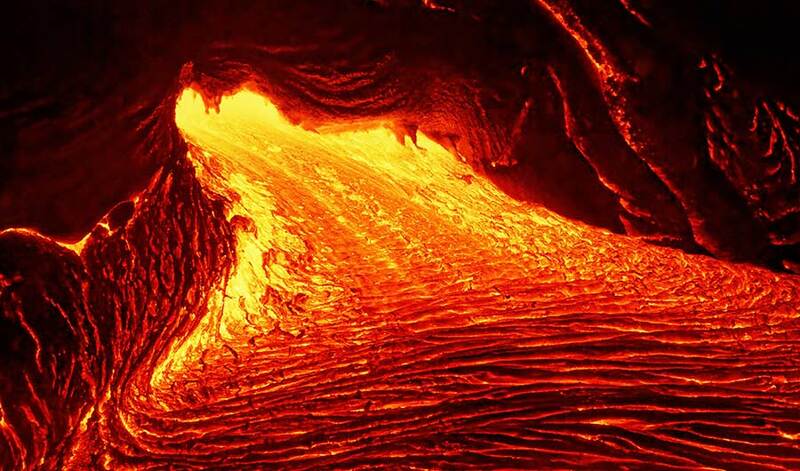 Reaching magma could be seen as a momentous milestone for humanity. But from the energy companies' point of view, magma meant failure -- a vast energy source that they didn't yet have the technology to use. So rather than being celebrated, the first ventures into Earth's molten depths slid quietly under the radar, said Eichelberger. The energy companies' accidental magma encounters are ironic given how hard volcanologists tried to accomplish the same thing in years past. After completing several drilling projects at the Kilauea Iki lava lake in the 1970s and early '80s, Eichelberger's then-employer, Sandia National Laboratories, embarked on an all-out effort to reach magma at California's Long Valley Caldera. In the 1980s and '90s, most volcanologists envisioned magma chambers as giant balloons filled with liquid rock, said Eichelberger. Several types of above-ground measurements seemed to point to such a balloon swelling close to the surface at Long Valley. Seismic waves from small earthquakes went still when they reached the valley, suggesting they had been dampened by something soft. Inside the valley, things weighed slightly less than they ought to, a gravitational anomaly indicating that what lay beneath was less dense than solid rock. Most striking of all, the ground itself was blistering upward, as if inflated by magma. The Sandia team set to work with a drill rig named Big Bertha, expecting to reach the margins of the magma chamber at around 13,000 to 16,000 feet. As Bertha neared those depths, they expected temperatures to rise. But from about 8,000 to 10,000 feet, the temperature held steady at around 220 degrees Fahrenheit -- remarkably cool for that depth in the basin-and-range region of the United States. The drill rig dubbed "Big Bertha" towers above treetops at Long Valley Caldera in California. Eichelberger's former graduate student Vicki McConnell led the later stages of the Long Valley project, and she remembers how the researchers' hopes sank. "It just stayed one temperature. And it was cold," said McConnell, who is now executive director of the Boulder, Colorado-based Geological Society of America. "It was just a gradual deflation as we came to realize that there's no reason to keep at this." Eichelberger said he was not closely involved in the Long Valley project, and wasn't entirely surprised when it failed to reach magma. He was an early skeptic of the "giant balloon" theory, suspecting that magma chambers instead spent much of their time in a partially solid state. So, during the years of the Long Valley drilling, he focused on another kind of project: drilling into the conduits through which magma had traveled to the surface during recent eruptions around the world. These conduits offered important clues about how eruptions work, said Eichelberger. But to his disappointment, they were all cold and solid by the time he reached them. Why is magma so hard to locate that volcanologists miss it, and energy companies hit it by accident? In short, existing tools for peering into solid ground are imperfect, and they get worse the deeper you look, said Peter Malin, a crustal seismologist and director of development at Asir Seismic in Dallas, who is working with Eichelberger and many other scientists to create the Krafla Magma Testbed facility in Iceland. The Landsvirkjun drill rig perches on the rim of a crater lake at Krafla caldera in Iceland. Researchers can map out some large structures by measuring how seismic waves and electromagnetic currents travel through the ground. But by the time you get about 1 kilometer down, said Malin, the resolution is too fuzzy to make out anything smaller than a football field. "You're out in outer space and you really can't see any of the details," he said. Even so, people might be able to do more with those tools if they better understood what they were looking for, said Eichelberger -- insights that could come from a close-up study of live magma. By 2009, Eichelberger was working as program coordinator for the United States Geological Survey's Volcano Hazards Program. He had all but lost hope of reaching magma in his lifetime. But, that year the Iceland Deep Drilling Project punched into magma at Krafla caldera. Accidentally, of course. The Iceland Deep Drilling Project, or IDDP, is a consortium of the Icelandic National Energy Authority and three Icelandic energy companies. Its primary goal is to generate energy using underground reservoirs of "supercritical" water, which is so hot and pressurized that it is neither exactly liquid nor steam. But in addition to its energy goals, the IDDP's agenda also includes research and information sharing, with academic collaborators and funding from scientific agencies such as the U.S. National Science Foundation. So unlike previous magma encounters, the IDDP's experience was reported in detail to the scientific community. "The nice thing about the IDDP is that the energy companies seem to be perfectly happy with us doing science, because they can see that this science advances their interests too," said Wilfred Elders, co-chief scientist of the IDDP, who is based in Riverside, California and is not part of the Krafla Magma Testbed team. The IDDP consortium planned to drill down to hot, pressurized water 2.8 miles belowground. But at just 1.3 miles, the drill bit started getting stuck. 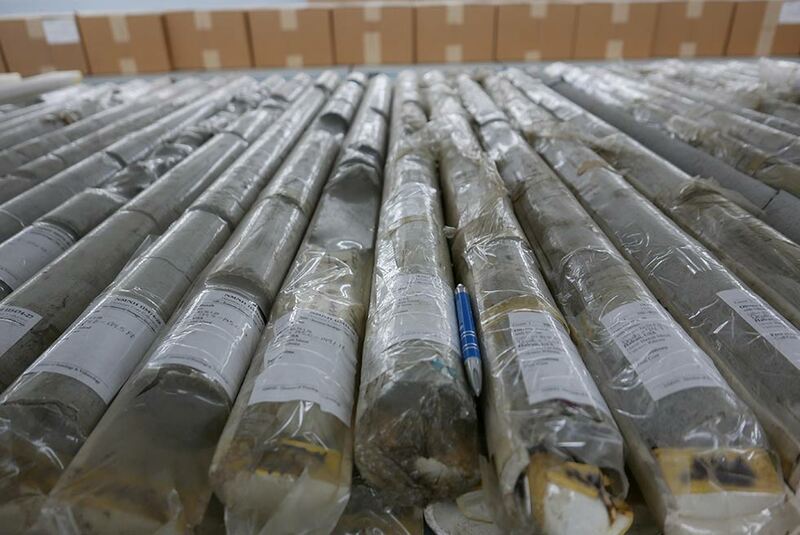 At first, no one knew why, said Anette Mortensen, a geologist with Landsvirkjun, the national power company of Iceland, which conducted the drilling. The answer came when Mortensen examined shards of rock carved out by the drill bit. With the naked eye they resembled black sand grains, but under a microscope they were glossy and translucent, all curved faces and sharp edges. "This was not the normal thing we see at this depth in geothermal systems. Instead we saw this very fresh glass," she said. "That told me that we must be drilling into magma." Landsvirkjun tried to use the water in the rocks higher up the well to produce energy. But after a series of equipment failures, they sealed the well with cement. Eichelberger heard the story from Elders and his colleagues at scientific meetings. "I thought, 'Oh my god, and they walked away from it?'" said Eichelberger. "They got the holy grail and they just threw up their hands and went off to the next project?" In theory, one should be able to take measurements from inside the magma chamber, using instruments made of the same heat-resistant metals researchers use to study molten rock in the lab, said Eichelberger. It should also be possible to carve cylindrical cores from the edge of the chamber by pumping large amounts of water through a donut-shaped drill bit. Drill cuttings from the IDDP well at Krafla seen through a microscope. The drill quenched the liquid magma to glass before cutting it into tiny shards. "As long as you're circulating enough fluid, the drill bit itself doesn't know that it's super hot out there," said Eichelberger. "It doesn't even know it's liquid, because you're quenching this stuff to glass ahead of the drill bit." But no one conducted such experiments in the IDDP Krafla well before it was sealed. The glassy drill cuttings and measurements taken inside the well shaft provided tantalizing bits of data, but those only raised new mysteries. For example, the temperature down the well rose far more suddenly than Eichelbeger or his colleagues would have expected, jumping from about 850 to about 1550 degrees Fahrenheit in the last 100 feet, said Yan Lavallee, a co-leader of the Krafla Magma Testbed project and also the chair of volcanology and magmatic processes at the University of Liverpool in England. "That in itself defeats all of our models of how heat is transferred from the magma in the rock," said Lavallee. Another mystery is why the drill cuttings were almost all glass. Most geologists would expect magma near the top of a chamber to cool and crystallize, said Eichelberger. The absence of crystals may mean that the chamber roof is melting upward -- or it may mean something else that they can't yet predict. The answers to such questions could clarify general principles of how magma melts and moves, said Eichelberger. He hopes that such discoveries could be applied to other volcanoes around the world, leading to better monitoring and safety for the millions of people who live near an active volcano. Volcanoes with modern monitoring systems rarely erupt without warning, although there are exceptions, such as the Mount Ontake eruption that killed 31 hikers in Japan in 2014. But false alarms are still a major problem, triggering disruptive and potentially dangerous evacuations and reducing people's confidence in future warnings, said Eichelberger. Moreover, Lavallee added, even if volcanologists can say when an eruption will happen, they often don't know how. "It's like, 'Oh yeah, magma is about it come out. But is it going to flow, or is it going to blow?'" he said. In some cases, said Lavallee, it may even be worth drilling into the magma chambers of other volcanoes that pose an eruption risk, and installing instruments to monitor activity at their source. Before any such project could move forward, however, researchers would have to reassure people that it would be safe. The IDDP well showed that magma can be drilled into safely at Krafla, but Eichelberger acknowledges that drilling in other volcanic areas could pose dangers. For example, magma wells could potentially release toxic hydrogen sulfide gas -- a problem officials are currently struggling with as Kilauea's ongoing eruption stirs up magma beneath the Puna Geothermal Venture plant in Hawaii. The most obvious concern for many people is that drilling into magma could trigger an eruption. However, the volcanologists interviewed for this article viewed such a scenario as highly unlikely. Molten rock has occasionally oozed a little way up a geothermal well, but unless there was a natural eruption in progress, it always cooled to an obsidian plug long before reaching the surface, said Eichelberger. That educated guess may not absolve them of liability, however, because after researchers drill into an active volcano, the public might be quick to blame the drilling project for all future eruptions, said Charles Carrigan, a geophysicist at Lawrence Livermore National Laboratory in California and part of the Krafla Magma Testbed team. Drilling magma chambers could potentially even be used to prevent eruptions, relieving pressure by literally letting off steam, said Lavallee. Eichelberger is skeptical of this prospect, but Lavallee speaks of it with delight, likening it to a scene in the children's book "The Little Prince" in which the hero cleans out his volcanoes with a broom. Steam and volcanic gases billow out of the IDDP well at Krafla in 2010. Eichelberger believes that in addition to helping people stay safe from volcanoes, magma research could be a stepping stone to a new kind of clean energy. Magma is far hotter than the rock around typical geothermal reservoirs, and it releases an extra burst of energy when it crystallizes, making it a superior thermal battery, according to Eichelberger. In the 1970s, the USGS tried to estimate how much energy was stored in molten and partially molten rock within a few miles of the surface. Those estimates contain a lot of uncertainty, noted Eichelberger, but if they're correct, then the U.S. has hundreds to thousands of times as much energy in magma as is used by the entire country each year. It was this vast potential power source that inspired Sandia National Laboratories to study Kilauea Iki lava lake, and later to seek magma in Long Valley, said Eichelberger. At that time in the 1980s, magma energy proponents envisioned sinking some kind of pipe into the magma and sending water through it to be transformed into super-heated steam. These days, attention has moved away from such direct heat exchange systems, although they remain a possibility for the future. Many people today are focused on water reservoirs that sit right atop magma chambers, seeping through cracks and pores in the rock and sucking away the magma's heat. Such water is likely to be supercritical, and supercritical fluids can carry far more energy than liquid or gas, said Elders. In theory, a supercritical geothermal well should produce about 10 times as much energy as a traditional one. 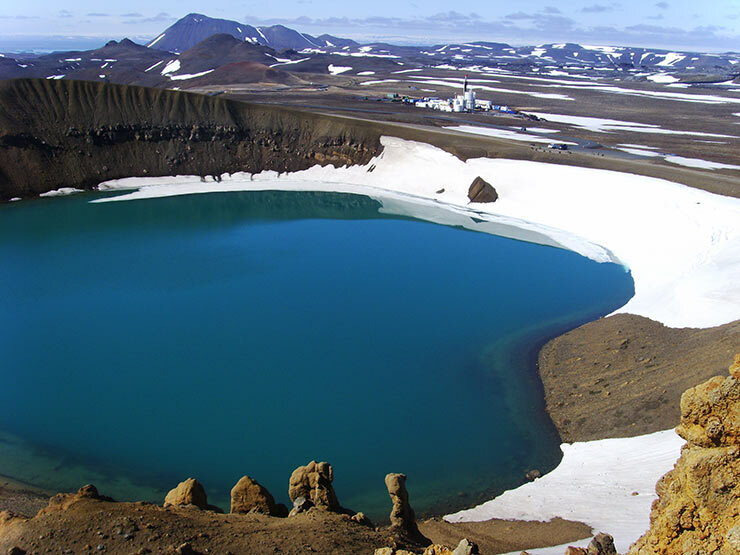 The IDDP consortium members were searching for supercritical water when they drilled at Krafla in 2009. Their measurements indicated that a large magma chamber lay about three miles belowground, with a supercritical reservoir right above it. When the drill instead struck magma at less than half that depth, the pressure was too low to create supercritical conditions. But the water above the magma was exceptionally hot, and for a couple of years before the equipment broke, the well produced enough super-heated steam to generated seven times more energy than a normal geothermal well. 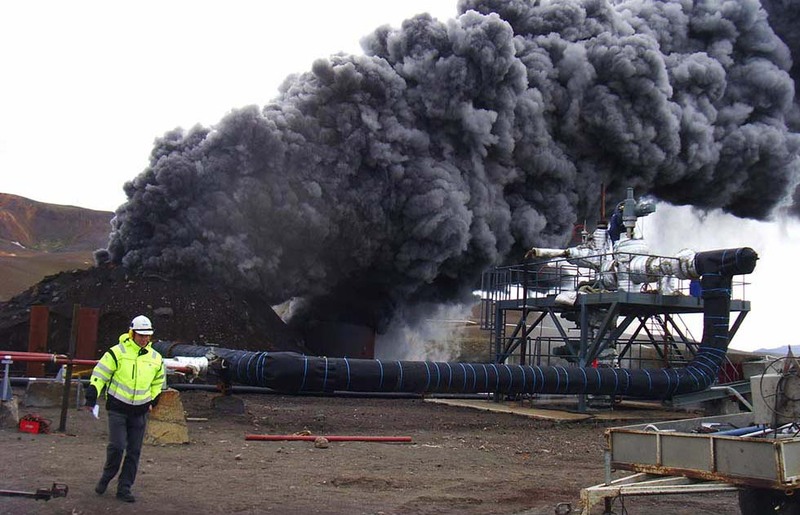 "We did generate the world's hottest production well at Krafla, because it was heated by magma," said Elders. The IDDP members went on to drill a second well on the Reykjanes Peninsula in Iceland, and this time they reached supercritical conditions at around 2.9 miles. They managed to avoid magma this time, but they believe a magma chamber lies nearby, ensuring a steady supply of energy. Elders and his colleagues have high hopes that this second IDDP well will become the first supercritical geothermal well in history. While it may be possible to find and use supercritical fluids with our current tools and knowledge, the IDDP's attempts in Iceland demonstrate that the process is still hit or miss. By studying magma directly, Eichelberger and his colleagues hope to gain insight into where magma and supercritical fluids are likely to be, as well as how they might behave when we try to tap them. "We would basically be prospecting for magma," he said. Eichelberger's vision for the Krafla Magma Testbed is grand: A permanent facility where researchers can drill multiple holes and monitor how magma changes over time. Despite its ambitiousness, the project has no shortage of supporters, having grown into a consortium of 50 government agencies, research institutes, universities and corporations around the world, according to Eichelberger. About 100 researchers have contributed thus far, led by Eichelberger, Lavallee, and others such as Hjalti Páll Ingolfsson, operational manager at GEORG - GEOthermal Research Group in Reykjavik, Iceland. "I think it's the most exciting piece of science since landing on the moon," said Lavallee. Even those who aren't involved look forward to seeing what the testbed might reveal. "It's a very interesting project. I hope they're able to succeed," said Ben Andrews, a volcanologist at the Smithsonian National Museum of Natural History in Washington, who is not part of the project. 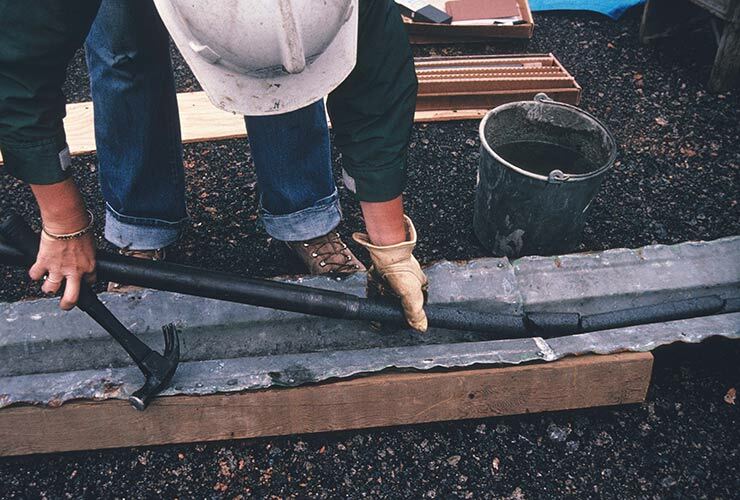 Rosalind Helz slides a section of core from the core barrel at Kilauea Iki lava lake in 1988. But the Krafla Magma Testbed faces plenty of hurdles. Eichelberger estimates that it will cost about $25 million to drill the first well, and about $100 million for the full supporting infrastructure -- modest compared to things like space exploration or high energy physics, but a "giant dream" for geoscience, said Eichelberger. No single funding source is likely to cover the entire price tag, so the team plans to assemble a collection of smaller grants from governments, energy companies, and scientific organizations. One such organization is the International Continental Scientific Drilling Program, which funded a planning meeting for the project in 2013. This group is now reviewing a request for a further $3.9 million and will announce its decision in June, said Ulrich Harms, head of the organization's Operational Support Group in Pottsdam, Germany. Harms is not part of the team reviewing the current proposal, but he makes no secret of his own opinion, calling the testbed "a splendid idea and an excellent opportunity." Eichelberger and his colleagues also face daunting technical challenges. For example, they will need to develop a well casing that won't buckle when the temperature changes, and they'll have to protect instrument cables from heat and corrosive gases. Helz, who is not involved in the project, wonders whether some of the technical hurdles might prove insurmountable, given the problems she witnessed at Kilauea Iki. When the drills at Kilauea hit material that was too hot and liquid, the water couldn't quench it fast enough, and the drill bit stuck, said Helz. The researchers could only retrieve cohesive sections of core when the lava was mostly solid to start with, containing no more than about 45 percent melt. Eichelberger hopes to get cores down to nearly pure melt, which would look like solid glass when cooled. 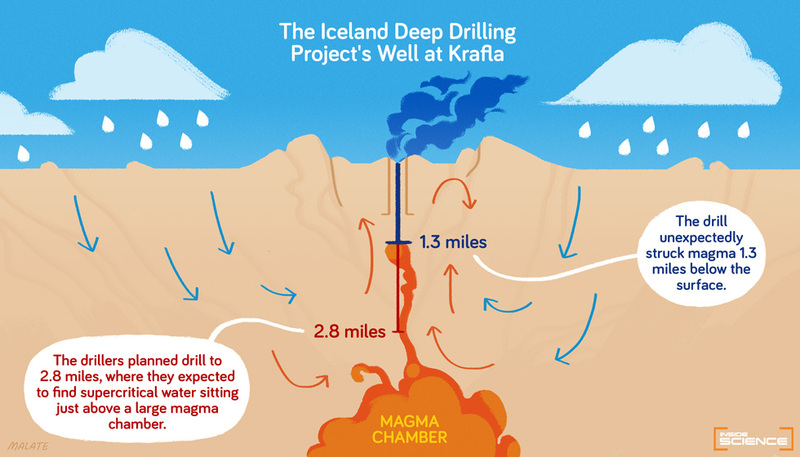 But his team will use much larger and more powerful drill rigs, probably capable of blasting 30 to 40 liters of water per second, said Sveinbjorn Holmgeirsson, owner of an engineering consulting business called GeoEnergy in Reykjavik and part of the Krafla Magma Testbed team. Lava lake cores taken from Kilauea Iki in 1967 lie atop cupboards in a back room of the Smithsonian Institution National Museum of Natural History in Washington, D.C. The lava lake cores Helz and Eichelberger took from Kilauea Iki may not represent true magma or pure melt. But for Eichelberger, they were the inspiration for a nearly 40-year quest. So on a Wednesday afternoon in April, I went to see these volcanic relics, trailing Helz and Andrews through the mothball-scented catacombs of a Smithsonian Institution storage facility southeast of Washington, D.C.
We passed row after row of looming white cabinets, finally stopping by a set of drawers that looked identical to all the rest. Helz slid one open. I stared inside, momentarily perplexed by the sight of these things that Eichelberger described as beautiful. They were dull grayish cylinders, broken into sections a handspan or so long. I lifted one, feeling its cool stone weight. Then I saw clusters of olivine, vivid spring-green crystals protruding from the broken ends. A magnifying glass revealed tiny bubbles, their black inner surfaces as glossy as Christmas tree ornaments. For Eichelberger, these small variations told part of a story -- a tale of heat and violence and transformation. Magma may tell the rest. And at 69 years of age, the gray-bearded volcanologist is still eager to learn more. "Elementary school kids are fascinated with dinosaurs and volcanoes," he said. "I just didn't grow up."